The delicate one. 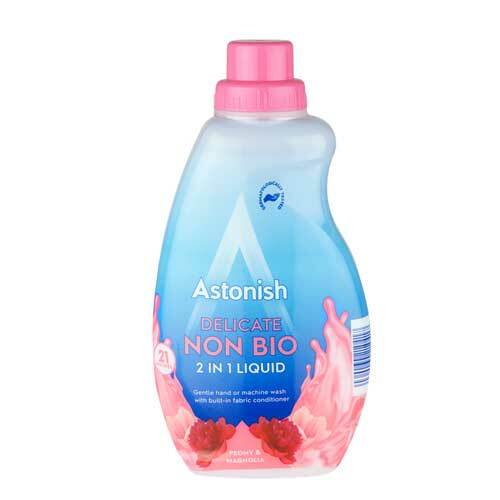 Our 2 in 1 laundry liquid with added fabric conditioner will leave your clothes brilliantly clean and soft next to skin. Whilst the delicate fragrance of Peony & Magnolia will take your senses on a journey. Almost makes doing the laundry enjoyable. Dose the product into your washing machine drawer using the cap provided. Alternatively dose the product directly into the washing machine drum using a dosing ball or device. Fill the inner cap reservoir completely for a 40ml dosage. For larger machines or larger loads (6-8 kg) use a 60ml dosage per wash. For hand washing dilute 40ml of product in 10 litres of warm water before washing garments. 21 standard washes based on a standard machine load and light/medium soil loading. Always refer to garment care labels before washing. Wash dark and light garments separately. Do not wash flame resistant fabrics at above 50 degrees Celsius.